A young man is confronted by the death of his mother. Distressed in the hospital, what seems to be her spirit appears to him and says he should go to Bucharest. This sets events in motion that has him sitting next to a man on the plane, telling Charlie about his daughter – the man unexpectedly dies beside him. 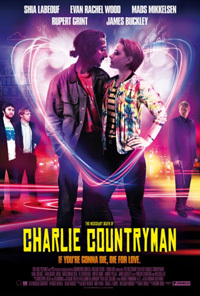 Charlie tracks the woman down and instantly falls for her, following her around Bucharest. In between distractions like hallucinating spiked drinks with some young British party animals from the hostel (including Harry Potter’s ginger pal), Charlie finds that the (cello playing) girl has some serious baggage in the shape of a deadly criminal husband / half-ex. The emotional Charlie is blind to the danger and imminent harm heading his way, as he chooses to follow his heart. Shia LaBeouf has taken somewhat of a drastic departure with his acting career, turning his back on the block buster Transformers franchise, for more indie, lower budget projects he feels more connected to and where he can portray layered characters in stead of running in front of green screens, the excessive CGI doing the talking as the movie’s focal point.